Have you ever wondered if that shiny new website was worth the investment? Do you lay in bed thinking, “How many people viewed my website today? Is my website making me any money?" There's a solution for your woes (at least the ones relating to your website). Meet Google Analytics, a free reporting system that houses all of your website data and provides you with an in-depth view of your online traffic. Before you access this new world of big data, be warned, looking at a Google Analytics dashboard is a lot like peering under the hood of your car. You should know some fundamental information before you start poking, prodding and causing oil to spew everywhere. Let's assume that you've already installed Google Analytics on your website. When logging in to G.A. for the first time, it will be a little overwhelming. You'll see a lot of numbers, graphs and pretty colors. Don't be intimidated. Let's look at a few important metrics that will help you make sense of all the madness. The first page you'll see is your Audience Overview. Your Audience Overview provides a macro look at all your website traffic. Here is a definition of what you're seeing. Bounce Rate: the percentage of single page visits. % New Sessions: the percentage of first time visits. Your Audience Overview provides you with a big picture look at your website analytics. Your Audience Overview will show you how much of your website traffic is new visitors versus recurring visitors by using cookies. These are not the delicious, fresh out of the oven kind, but the digital kind. Your computer has cookies and once you’ve visited a website, that cookie will be tracked. If the cookie revisits the website, that visit is counted as a recurring visitor. Google also tracks the amount of time people are spending on your site (also known as Average Session Duration). However, in order for this tracking to begin, the user must click to another page of your website in order for Google to record the time. If a user decides to stay on the homepage, then the time on site, or Session Duration, will be a giant zero since the visitor did not click to another page. This is really important to remember. The Session Duration also excludes the amount of time the user stayed on the final page. If you are seeing an average of 0:00:00, then users are not interested in browsing your website and exiting after seeing a single page. This brings us to Bounce Rate. The Bounce Rate, which can be a direct correlation to the Session Duration, is important because it lets you know how many people are exiting your website after seeing a single page. It varies by industry, but generally a website averages between a 40-60 percent Bounce Rate. A high Bounce Rate is not a good sign for a website (somewhere north of 70 percent). Typically, a high Bounce Rate indicates disinterest in the website for one reason or another. However, a high Bounce Rate can also indicate the the visitor came to your website, grabbed the information they needed (a phone number or address) and left. It's important to keep the Bounce Rate in context of what you actually want the visitor to do. Now that you passed the introductory level (congrats!) 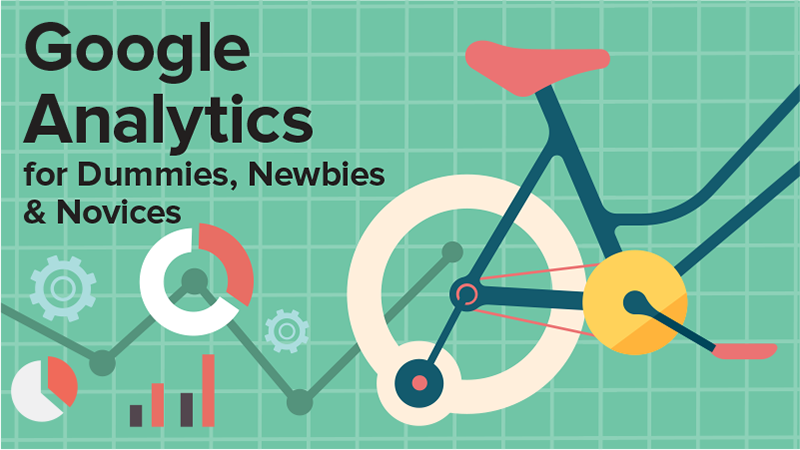 of Google Analytics, we can now remove the training wheels and move on to a few more advanced metrics you should know. 1. Location: Seeing the location of your website visitors is important. 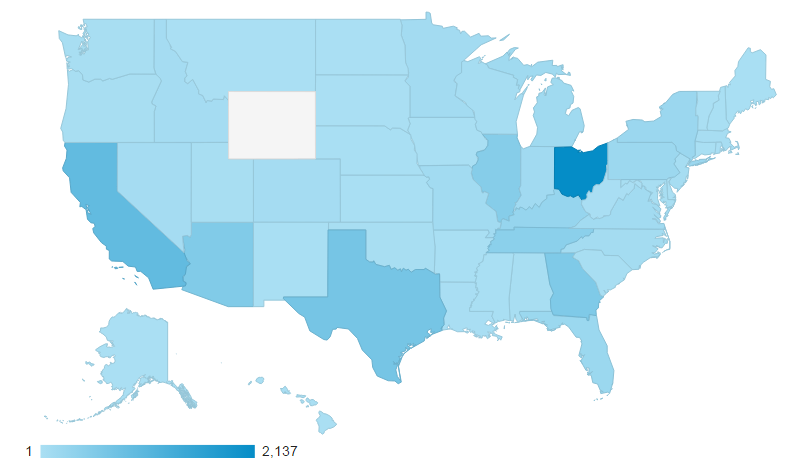 It helps you understand if your website is attracting visitors from the area you do business in and surrounding cities and states. You can use this information to make decisions with other marketing efforts like paid advertising or direct mailers. However, if all your traffic is coming from some remote island in the South Pacific, then you're likely receiving referrer spam. Here's how you can block referrer spam traffic. If you're running a paid advertising campaign in a certain market, the Location view is a great way to see how it's contributing to your traffic. 2. Mobile Overview: This view allows you to see what type of device visitors are using when visiting your site. Device type is broken down in to three different categories - desktop, mobile and tablet. By now, your website should be mobile friendly. Visitors on mobile devices should have a pleasant browsing experience just like on desktop. If not, you'll likely see that your mobile visitors have an extremely high bounce rate (over 90 percent). If this is the case, you need to invest in a mobile website right away. With nearly 30 percent of all website traffic coming from mobile, it's imperative that your website is optimized for these devices. Google knows that consumers are using mobile devices for online searches and purchases, which is why it rolled out its Mobile Usability Algorithm (AKA Mobilegeddon) at the end of April. If your website is not mobile friendly then you can kiss your mobile search ranking goodbye. 3. 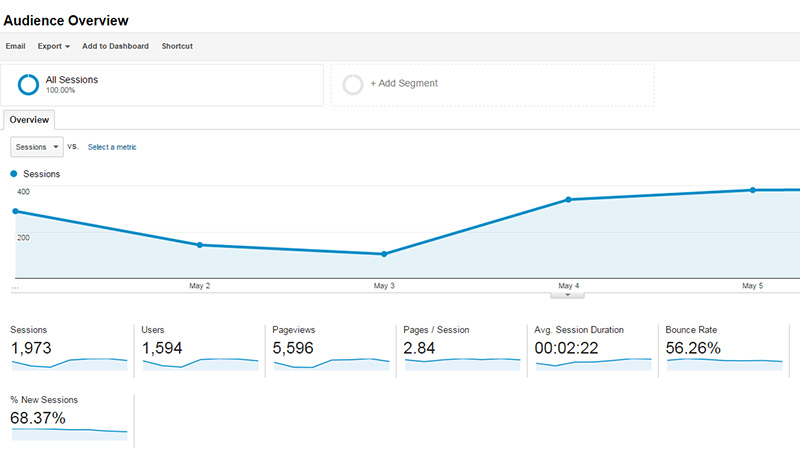 Acquisition Overview: This view lets you analyze how visitors are getting to your website. By default, there are three different acquisition channels - Organic Search, Direct Traffic and Referral Traffic. Organic Search: When a visitor finds your website through a traditional web search on one of the main search engines like Google, Bing or Yahoo. This means that your website showed as a search result organically without the need to pay for placement. Direct Traffic: When the searcher either types in your website URL directly into the search bar OR the searcher has your website bookmarked and saved. These visitors are considered your recurring customers and can be your most loyal customers. Referral Traffic: When another existing site refers your website to the searcher and the searcher proceeds to click on your website to visit it. Typically you will see local directories, like Yelp, YellowPages, Google+ and so on, represent your referral traffic. What acquisition channels are you investing in? This view will allow you to see where your time is best spent. There are more options that you or your “web guy” can add to monitor how visitors are getting to your website. For instance, if you have a heavy social media presence, you can add Social as a form of measurement. You can also connect your paid advertising and email marketing accounts to Google Analytics to track the success of those marketing efforts. 4. Site Content/All Pages: Google Analytics lets you see the specific pages or content that searchers are viewing when visiting your website. You can see this information under the Behavior tab along the left hand side by clicking on Site Content and choosing All Pages. This information breaks down the traffic to each page of your website. If you own a business with multiple products of services, you can track what services and/or products are most viewed. This will help you understand what pages visitors are most interested in. Google Analytics is a great tool to analyze your website traffic and target audience. You have an unlimited amount of data right at your finger tips. However, you need to know what you're looking at before you start marketing changes to your website and marketing strategy. We encourage you to put some time aside every few weeks and take a look at your Google Analytics account to make sure your website is aligned with your existing marketing goals! By doing so, you could discover new marketing opportunities you didn’t know existed and reach potential customers that could increase your bottom line. With that being said - good luck, happy analyzing and stay tuned for Google Analytics advance edition!